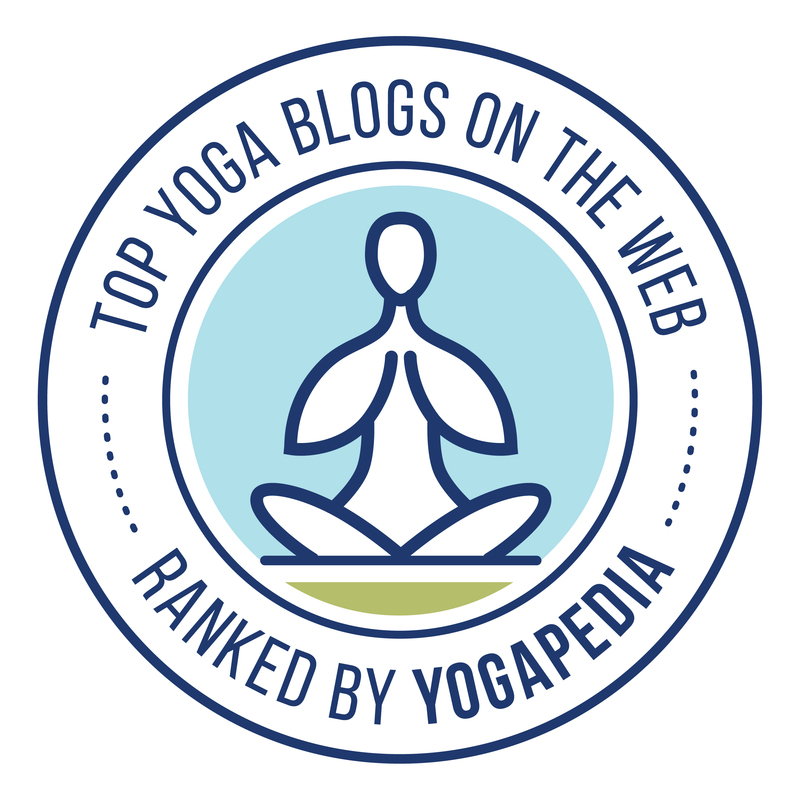 Different Yoga scriptures list a different number of precepts of Yama. Yoga Sutra of Patanjali prescribes five precepts: Ahimsa, Satya, Asteya, Brahmacharya, and Aparigraha. In other words, Non-violence, Truthfulness, Non-stealing, Continence, and Non-receiving are the five-fold Yama. Satya is the second precept of five-fold Yama. The Sanskrit word Satya is commonly understood as Truth or veracity. The meaning it indicates is more than the meaning the English word Truth indicates. It is derived from the Sanskrit root Sat which means reality or existence. Sat refers to empirical reality. In Rig Veda, we come across the triple term: Satyam Rtam Brhat. It is one of the most important religious conceptions of Rig Veda. The three terms are explained by Sri Aurobindo in his book: The Secrets of the Veda. He explains "This psychological conception is that of a truth which is the truth of divine essence, not truth of mortal sensation and appearance. It is Satyam, the truth of being; it is in its action Rtam, right, — the truth of divine being regulating right activity both of mind and body; it is Brhat, the universal truth proceeding direct and undeformed out of the Infinite." In other words, Satyam is the reality of divine essence; Rtam is the reality in action or the manifestation of the divine essence; Brhat is the reality of existence in its entirety or vastness. Internally, Satyam indicates the truth of being; Rtam indicates the truth of knowledge and action; Brhat indicates the illuminated consciousness the nature of which is wide and large. Rig Veda declares "Ekam Sat Vipra Bahuta Vadanti" which means "the existential reality is one; whereas the learned ones call them by different names." It should not be interpreted as truth is one, as it is normally being done. It denotes something more than the word truth denotes and evidently different from truthfulness. It definitely means the ultimate reality of existence. It seems that the word Satya had been used to mean existential reality before its meaning had evolved to be an ethical concept of truthfulness that applies to the mind and body. It was originally used interchangeably with the word Sat. Later, the word Sat has been used to mean the absolute truth and Satya has been used to mean the relative truth or worldly truth the nature of which is changing from time to time; where absolute truth is permanent. In Gayatri Mantra, seven worlds of Hindu cosmology are mentioned: Bhur, Bhuva, Suva, Maha, Jana, Tapa and Sathyam. The world of Satyam or truth is the supreme world. It is a symbolic representation. But in Vedanta, the seven worlds correspond to seven psychological planes of consciousness: Anna, Prana, Manas, Vijnana, Ananda, Chit, and Sat. Sada Eka Rasa, Sada Eka Rupa. The nature of Sat is one essence and one form. Sat-Chit-Ananda is Existence-consciousness-Bliss. Only Atman has triple aspects of Sat-Chit-Ananda. Sat is the eternal truth. Chit is the supra-mental consciousness that transcends all. Ananda is the eternal bliss. It has no beginning and no end. It exists forever. It is the quality of Atman. Hence Sat is the quality of Atman only. In Yoga, Satya is one of the Dharma to be observed. Dharma means the observances of righteous thoughts and behavior. 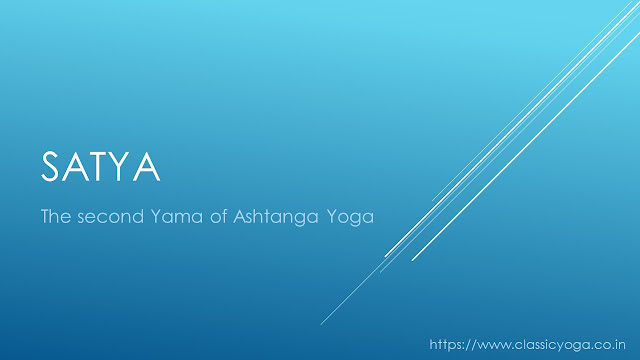 It is one of the five Yamas or Self-restraints prescribed in Ashtanga Yoga. Patanjali defined Satya as "Satya-pratiṣthāyaṁ kriyā-Phala-āśrayatvam". It means "by the establishment of truthfulness, the Yogi gets the power of attaining the fruits of works without doing work, for him and other". Swami Vivekananda explains "When the power of truth is established with you, then even in a dream you never tell an untruth, in thought, word, or deed; whatever you say will be the truth. You may say a man 'Be blessed' and that man will be blessed. If a man is diseased, you say to him 'Be thou cured,' he will be cured immediately". Being untruthful is being self-deceptive. Self-deception always makes one guilty. As a result, the mind gets modifications that are detrimental to Yoga. For successful Yoga, one should cultivate truthfulness in thought, speech, and deeds. One should practice Satya not because it is one of the moral dharma or restraints but because it is detrimental to yoga. Asatya or non-truthfulness makes one's mind impure. If you tell a lie, you have to go for more lies to maintain that lie. It makes pressure on your mind and results in a chain of modifications. Bhagavad Gita 17.23 states that Brahman is also called by the names Om, Tat, and Sat. Om is Brahman; Tat is Brahman; Sat is Brahman. Verse 17.26 states that Sat is used in the sense of Truth as well as in the sense of Supreme. The word Sat is used in all auspicious rites and ceremonies. Verse 17.27 states that Sat reposes in all yajnas, penances, and charities. It reposes in all the activities meant for Brahman. What if the act of cultivating Truthfulness goes against the precept of non-violence? For example, when the truthfulness of one person harms the other, then what should one do? He should stick on to Ahimsa. His truthfulness should not harm others. In this sense only, the scriptures say "Ahimsa Paramo Dharma" which means "Non-violence is the supreme Virtue". The word Satya occurs more than hundreds of time in Rig Veda always meaning the reality of existence or the essence of being. "May Agni, the priest of the offering whose will towards action is that of the seer, who is the existential truth, most rich in varied inspiration, come, a god with the gods." "The good that thou will create for the giver, that is that reality of thee, O Angiras." Here the Satya means the reality or truth of being. Beingness is the only truth that is permanent. Simply put, it is the absolute truth which is the truth forever. In Upanishads, Satya is used both in the senses of existence and righteousness. It means "It is, in fact, the truth. That is why when one speaks the truth, they say he speaks dharma or righteousness and When one speaks dharma, they say he speaks the Truth. Both are the same." Now the meaning of Satya has evolved to be the righteousness or dharma. Taittriya Upanishad 11.11 states, "Satyam Vada, Dharmam Chara". It means, "Speak the truth. Lead the path of righteousness." It means, "Truth alone triumphs. Not falsehood. The divine path is spread-out through truth. By this Path, the seers who have mastery over their desires reach the supreme treasure of Truth". Here we could see, the word Satya is described as righteousness and as the supreme truth of existence. Hence in earlier Upanishads, the word Satya is used denote both the meanings of empirical truth and the absolute truth. Advaita Vedanta explains three levels of truth: Vyavaharika Satya, Pratibhasika Satya, and Paramartika Satya. It is the empirical truth that experienced in day-to-day life. The activities incidental to practical life are called Vyavaharika Satya. It is the reality that we face in the practical world. The duality of the experiencer and the experienced is the basis of this truth. Here, Jiva, World, and God are different realities. This truth ceases to exist when the duality disappears. It is truth or reality in empirical stand-point only. Pratibhasa means illusion. A thing or a concept that appears to exist and does not exist in reality. For example, a dream seems to exist while the dreamer is in sleep. But in reality, it has no existence. It ceases to exist, once the dream is over. Paramartika Satya means supreme truth: the reality of which exists in all other truths. It is the eternal truth that exists always and in all states. There is no absence of Supreme Truth. In the presence of the absolute truth, all other truths have no existence. Brahman is the supreme or absolute truth. There is no duality of Jiva. Brahma Satyam Jagan Mithya, Jiva Brahmaiva Na Para. It means Brahman is the reality, Jiva is a delusion. Nothing supersedes the truth of the oneness of Jiva and Brahman. Nagarjuna, the second-century founder of the Madhyamika school of Buddhism expounded two aspects of Satya: Samvritti Satya and Paramartika Satya. Samvritti Satya is empirical truth; whereas Parmartika Satya is the ultimate truth. Samviritti Satya is based on the knowledge of the external world and can be grasped with the verbal designation; whereas Paramartika Satya is beyond the words and thoughts and can be grasped by means of intuition only. It is the truth that of universal emptiness or sunyata which is the true nature of the empirical world that has no independent substantiality. Some argue that Sri Adi Sankara of Advaita sub-school of Vedanta philosophy borrowed this doctrine of Paramartika Satya from the Madhyamika school of Buddhism. But one should understand the difference between the basic philosophical concepts. Satya is one of the five fundamental principles of Jainism. The five principles are called Pancha Mahavirat. The Pancha Yama of Ashtanga Yoga and Pancha Mahavirat of Jain philosophy are the same: Ahimsa, Satya, Asteya, Brahmacharya, and Aparigraha. They are the same by their name but different by their connotations. According to Jainism, the fundamental principle of truthfulness states to choose the right between the right and wrong and to choose the eternal between eternal and temporary in whatever stage of life one is. In Sikhism, Satnam is the most sacred Mantra. Satnam is the combination of two words Sat and Nam. Sat means truth and Nam means Name. Satnam here indicates the All-Pervading-Supreme-Reality. It appears in the Guru-Granth-Sahib, the sacred scripture of the Sikhs. It is part of the moola-mantra which is repeated by Sikhs daily. Sri Aurobindo, The Secrets of Veda with selected Hymns, Sri Aurobindo Ashram, 1998. Maurice Bloomfield, A Vedic Concordance, Harward University, 1906. T.Paramasiva Iyer, The Riks, The primeval Glimpse of Light and Life, Mysore Government Press, 1911. Suredernath Dasgupta, A History of Indian Philosophy, Cambridge University Press, 1922.